The facilities are headed by Mr. Gerry Hardy who has been a well known experienced specialist of the Amazon for more than 30 years. He is supported by his wife Cleide and a professional team. ﻿﻿﻿The farm is the starting point for trips and excursions into the closer surroundings of the virgin forest. into the unique ecosystem of its flora and fauna, its history and the sociopolitical background. ﻿﻿On request we offer an individual program for you which can also include special areas of interest or a personal guide. ﻿If you are interested you can get actively involved. We also arrange expeditions on regional boats, exploring the mysterious beauty of the Rio Juma or Amazon area. We also do paddling tours in small boats or Indian dug-out canoes into the Juma reservation. We are ready to please your wishes at any time. Please note that for organizational reasons or weather conditions, there may be local changes in the time sequence. Pickup at hotel in Manaus at 8:00. You see the famous "Meeting of the Waters" (Encontro das Aguas). At 12:00 arrival at Juma Lake Inn. Excursion by boat, Piranha fishing, watching birds and pink or grey river dolphins. Caiman Safari by night into the darkness. Break of dawn-Tour, observing bird life and listening to the sounds of nature. Rain forest excursion: Tracking through the high forest with an experienced guide showing you the fauna and flora. Break of dawn tour, observing bird life and listening to the sounds of nature. Tour by boat to the rainforest camp "Tapir". A traditional Indian camp used when hunting. Dinner is made on a campfire. Listening to the sounds of rainforest. You will be astonished how snugly you sleep in an Amazon hammock protected by mosquito net under a green roof construction! Tour by boat to a traditional Caboclo-Family where you see how they live. Planting and processing manioc, tropical fruit trees, medicinal herbs, rubber trees and domestic animals. Boat-excursion to the flooded forest, looking for monkeys, sloths, birds and reptiles. Tour to a Seringueiro (rubber collector). You will see, how the natural rubber is gathered and processed in the traditional way. Sport Fishing Tour by boat. You learn fishing tricks on this tour to catch fishes withexotic names like Tucunaré or Aruaná. 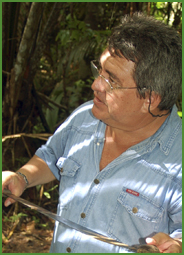 Walking tour in the rainforest to deepen your knowledge about nature of rainforest. Daily up from 1 person. Pickup in Juma Lake Inn 13:30 – arrival at Manaus (hotel / center) ca.18 Uhr. All accommodations in private huts with WC and shower bath. Breakfast, lunch and dinner, and mineral water is available at any time. Optional and by request vegetarian food is offered. In the price do not include: beer, Coca Cola, lemonade, Caipirinha, personal issues. All tours and excursions with English speaking guides, further languages on request. Individual extensions prior to arrival or locally available. The highest water level is up to 12 meters higher in June / July. During this time you can go by boat far into the woods. The lowest water level is in September / October. It is a good time for fishing. Between September and February there are nearly no mosquitos at the Juma Lake Inn. From February to September the mosquitos appear from dawn to daybreak. The houses are protected with special mosquito meshing. Electricity (generator) is used from 11:00-13:00 and 18:00-22:00. ﻿Children should be able to swim, the river being easily accessible. The tour-program sometimes changes depending on the weather conditions. Beachten Sie bitte, dass sich, je nach Jahreszeit, Wetter und Wasserstand, der Tourenablauf vor Ort ändern kann! The main luggage can be left in Manaus at the hotel. Copyright © 2018 Juma Lake Inn, Cologne und Manaus. All rights reserved.